Fitness doesn’t have to mean bootcamps and slogging it out in the gym. There are literally 1000s of different ways to be active in a non-traditional fitness environment! On MoveGB, you can browse the huge variety of activities we have available under our monthly memberships, and you’ll be sure to find some pretty cool and interesting ways to keep fit…. From handstand classes to Beyonce dance classes, working out doesn’t mean you have to be chained to a treadmill anymore! So there are so many different things to try… but have you ever considered Aerial Hoop? Aerial activities are fast becoming a brilliant way to keep fit and toned. From Aerial Silks to Aerial Yoga, it’s a trend that isn’t going away as the results are pretty fantastic. And it’s fun too - we love a good activity that makes you sweat and smile! If you haven’t yet tried an Aerial Hoop class but are intrigued, we’ve pulled together a brill beginners guide to Aerial Hoop with our top London-based Aerial fitness school, Flying Fantastic. 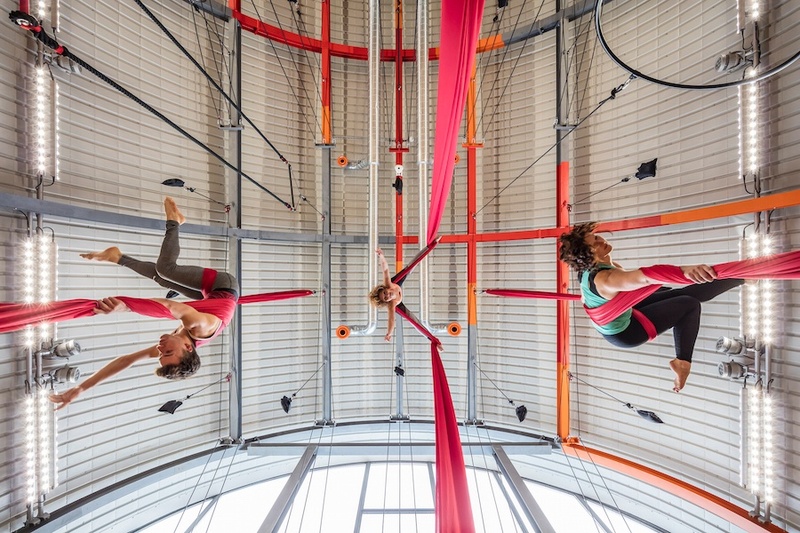 With venues across London, they offer a wide range of aerial disciplines to ensure that there’s something for everyone, and all can experience the thrill of life upside down. Aerial Hoop is exactly that! It is a large round metal ring that is suspended from the rig and involves you sitting in, standing on and hanging beneath in a variety of beautiful, elegant poses. As you improve you will learn moves that are increasingly dynamic and may involve a spin! Why should I give Aerial Hoop a go? Aerial Hoop is a fantastic physical and mental challenge that will build strength and flexibility. With each class you will feel more confident, strong and amazed with what your body can do! What benefits will Aerial Hoop bring to my body and my fitness? Aerial Hoop is a full body workout. You will build strength in your arms, shoulders and upper body, and it’s a fantastic way to strengthen your core. You should also see improvements in your flexibility, balance and coordination as you slowly begin to contort your body to new poses. Some have even likened Aerial Hoop to yoga wrapped around a Hoop - it’s an art form. And when you create those new shapes on the Hoop, your self-confidence will sky rocket! Aerial is also a great way to improve your mental health, many students find that the concentration required in learning aerial is very mindful. I have pretty good upper body strength - can I skip straight to an intermediate aerial Hoop class? Having good upper body strength will definitely come in handy, but you should always start at a beginner level when you’re new to Aerial Hoop. Without having learnt all the foundation moves you would struggle to keep up with the pace of the class, and it’s paramount that you learn how to safely move on the hoop when it’s your first time. But don’t worry, there’ll be big pads beneath the Hoop to catch you if you fall! Is the Hoop painful? Will I get blisters? There is no denying that Hoop can be quite painful (it is a big metal ring after all!) and yes, you probably will get blisters at first! However, it is worth persevering. As your body gets used to moving on the Hoop, it will feel more comfortable and your hands will increase in endurance and grip. You may also end up a little bruised from learning the new moves. What other workouts will help improve my Hoop performance? We would recommend Yoga and Pilates. The stretching and strengthening will help make the moves you learn on the Hoop more efficient and effective. Cardio is always useful and will help to give you stamina. What should I expect from a beginners class at Flying Fantastic? Our classes always start with a warm-up - make sure you’re on time because if you don’t do the warm up correctly you risk injuring yourself. It will involve a mixture of cardio to get the heart rate up, and some moving stretches to warm up the muscles. Then you will move onto the equipment and start with a set of conditioning movements. After that, it’s time to learn new moves or build on what you may have learnt in a previous class. Sometimes the Hoop can feel like it has a mind of its own! It can feel a bit wobbly and unstable but as you get more familiar with it you’ll soon feel more comfortable moving from shape to shape. What should I wear to an Aerial Hoop session? We recommend wearing form fitting clothing that cover the backs of your knees and shoulders. Loose clothing can get caught and be sure to tie your hair back too! Please avoid wearing anything with zips, buttons, studs or sequins. You may want to bring a long sleeved top as some moves are more comfortable with your arms covered. Don’t worry about socks or shoes as Aerial Hoop is practised in bare feet. What are the signature Aerial Hoop moves for beginners? You’ll start off learning a few different ways to mount the Hoop and from there you’ll learn some basic shapes that will form the basis of future tricks. Although teachers often have different names for things you are likely to learn: Mermaid, Gazelle and Man in the Moon among many others! Check out a few great moves from Flying Fantastic movers below! Get out of your comfort zone and challenge your body to something new! Trying new things will keep your body on its toes and train different muscles in new ways. Aerial Hoop will bring about so many benefits to your mind and body so give it a go! If you’re in London, be sure to check-out the Flying Fantastic venues to get an amazing beginner experience on the Hoop!